A married couple dubbed the "Criss-Cross Bandits" have been arrested and indicted for a series of bank robberies in the Phoenix area. ABC15's Danielle Lerner has the latest. 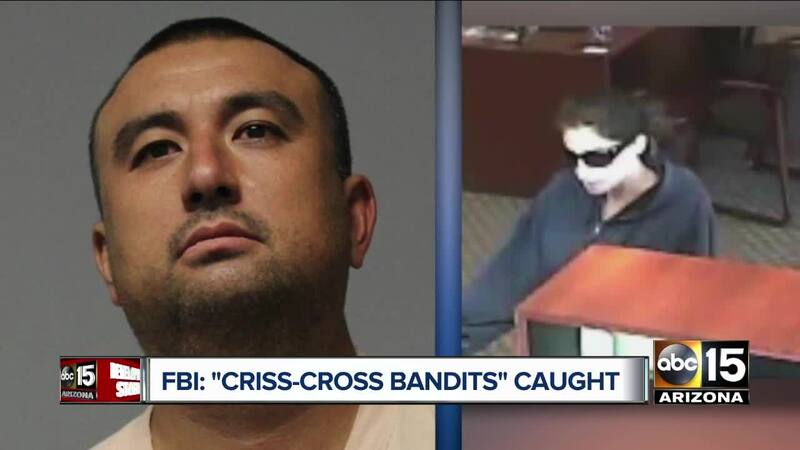 A married couple dubbed the "Criss-Cross Bandits" have been arrested and indicted for a series of bank robberies in the Phoenix area. FBI officials say 39-year-old Seitaro Kline and 34-year-old Carrie Kline were wanted in connection with nine bank heists in metro Phoenix between November 2016 and July 2018. The couple's nickname came from alternating the robberies, which involved a demand note and fleeing the bank after getting a known amount of money. They say the Klines recently were taken into custody without incident with help from the FBI in Albuquerque and the Yavapai County Sheriff's Office, but didn't provide an arrest date or any details Wednesday. The couple was indicted Sept. 4 for nine bank robberies plus one count of conspiracy and FBI officials say additional charges may follow.